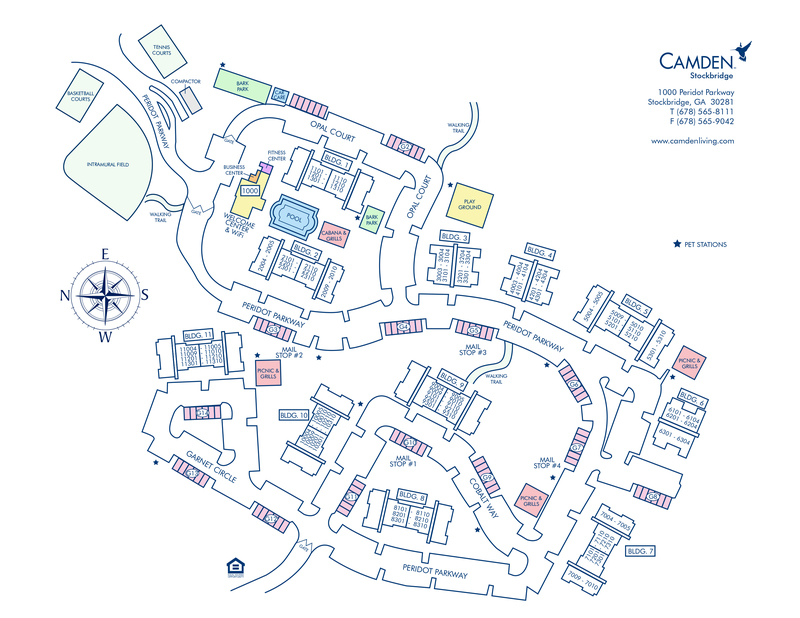 If you live in one of our one, two and three bedroom apartment homes at Camden Stockbridge, you are close to all the events that go on in Atlanta, and far enough from the busy city to have peace and quiet. You will love the custom touches inside some of our apartments like the high archways, ceiling fans, built-in bookshelves, custom cabinetry, raised countertops, kitchen pantry, full-size washer and dryer, fireplace, walk-in closets, double sink vanity and a relaxing garden tub. Camden Stockbridge is right up your alley if lifestyle and fitness are important to you. Our fitness center is complete with cardio machines, stability equipment, resistance bands, and plyo boxes for you to raise the bar on your workout. Play a game of soccer in the green space of our sportsplex which also includes a baseball field and lighted tennis court. Walk or jog with your dog around our community or let them run free in our large gated dog park with outdoor seating. Did we mention how pet-friendly we really are? We welcome up to three pets per apartment! Our location is great for our furry friends because we are right around the corner from Clark Park Bark Park, Pet Kingdom Grooming Salon and Paw Pad Boarding for all of your pet needs. Entertain your family or friends and grill up some barbecue at the outdoor grill pavilion. Feel like you are on vacation by getting some sun or take a dip in our refreshing salt water pool. Car buffs will appreciate the car care center and the option of a detached garage. Regardless of what you enjoy doing; you will breathe easy in any of our non-smoking amenities. We're located near I-75 and I-675 which makes commute time to downtown Atlanta about 30 minutes – perfect for all of the fun things to do in the city. We are approximately 20 minutes to the Hartsfield-Jackson International Airport, 20 minutes to Atlanta Motor Speedway and 15 minutes to The Beach at International Park, located in Jonesboro, Ga. Stockbridge and Henry County also have some of the best schools. Residents receive a technology package included in the total monthly rent with a savings of up to 44% off retail. This money-saving package includes high-speed internet up to 150 Mbps and over 140 digital video channels through Xfinity. Use the Xfinity Go app on your smartphone or tablet to access your digital video anywhere! Come home to Camden Stockbridge and love where you live. Call today to make an appointment to see your beautiful new apartment home! Garages are available too! Detached garages are available to rent for $50 per month.